Last week we discussed what we know about the first hour of MH370’s disappearance, based on primary radar data and the first Inmarsat BTO value. Today I’d like to talk about the BFO data and what it can tell us about MH370’s fate. As longtime readers of this blog well know, the Burst Frequency Offset (BFO) is a type of metadata that measures how different the frequency of an Inmarsat signal is from its expected value. It is an important value to a communications satellite operator like Inmarsat because if the value gets too large, the system will be operating outside its approved frequency limit. One cause of such a change would be if a satellite begins wandering in its orbit, which indeed was the case with MH370. The fact that the Satellite Data Unit (SDU) aboard MH370 did not properly compensate for drift in the Inmarsat satellite overhead is the reason the BFO data contains a signal indicating what the plane was doing. The plane had turned south by 18:40. The BFO value at the time of the first incoming sat phone call at 18:40 indicates that the plane was traveling south. At 0:19:37 the plane was in a rapid and accelerating decent. However, as I’ve previously described, if all of these things were true, then the plane would have been found by now. So at least one of them must be false. In the course of my interview with him, Neil Gordon said that the ATSB is firmly convinced that #3 is true, and that as a result he suspects that #2 is not. Specifically, he points out that if the plane were in a descent at 18:40, it could produce the BFO values observed. Thus it is possible that the plane did not perform a “final major turn” prior to 18:40 but instead loitered in the vicinity of the Andaman Islands or western Sumatra before turning and flying into the southern ocean. If this were the case, it would result in the plane turning up to the northeast of the current search area. An example of such a route has been described by Victor Iannello at the Duncan Steel website. It is worth nothing that such a scenario was explicitly rejected as unlikely by the Australian government when they decided to spend approximately $150 million to search 120,000 square kilometers of seabed. The reason is that it was deemed unlikely that the plane would just happen, by chance to be descending at the right time and at the right rate to look like a southward flight. For my part, I also find it hard to imagine why whoever took the plane would fly it at high speed through Malaysian airspace, then linger for perhaps as much as an hour without contacting anybody at the airline, at ATC, or in the Malysian government (because, indeed, none of these were contacted) and then continuing on once more at high speed in a flight to oblivion. Well, is there any other alternative? Yes, and it is one that, though historically unpopular, is becoming imore urgent as the plane’s absence from the search area becomes increasingly clear: the BFO data is unreliable. That is to say, someone deliberately altered it. There are various ways that we can imagine this happening, but the only one that stands up to scrutiny is that someone on board the plane altered a variable in the Satellite Data Unit or tampered with the navigation information fed back to the SDU from the E/E bay. Indeed, we know that the SDU was tampered with: it was turned off, then logged back on with Inmarsat, something that does not happen in the course of normal aircraft operation. It has been speculated that this depowering and repowering occurred as the result of action to disable and re-enable some other piece of equipment, but no one has every come up with a very compelling story as to what that piece of equipment might be. Given the evident problems with the BFO data in our possession, I feel we must consider the possibility that the intended object of the action was the SDU itself. When I say BFO tampering has been “historically unpopular,” what I mean is that almost everyone who considers themselves a serious MH370 researcher has from the beginning assumed that the BFO data was generated by a normally functioning, untampered-with SDU, and this has limited the scenarios that have been considered acceptable. For a long time I imagined that search officials might know of a reason why tampering could not have occurred, but I no longer believe this is the case. When I questioned Inmarsat whether it was possible that the BFO data could have been spoofed, one of their team said “all Inmarsat can do is work with the data and information and the various testings that we’ve been doing.” And when I raised the issue with Neil Gordon, he said, “All I’ve done is process the data as given to me to produce this distribution.” So it seems that the possibility of BFO spoofing has not been seriously contemplated by search officials. If we allow ourselves to grapple with the possibility that the BFO data was deliberately tampered with, we quickly find ourselves confronting a radically different set of assumptions about the fate of the plane and the motives of those who took it. These assumptions eliminate some of the problems that we have previously faced in trying to make sense of the MH370 mystery, but introduce new ones, as I’ll explore in upcoming posts. SBIRS GEO’s main mission is to monitor Russian (and Chinese?) territory for a missile launch. I did wonder if SBIRS was one of the data sources that allowed the US government to say that MH370 did not fly north, since that would have taken it into the SBIRS area of coverage. There is less reason for SBIRS to monitor the southern hemisphere. Maybe you are due for some sensitivity training. I did not have you pegged as a millennial. The pilot in question could have had a mistress or other extra-familial habits. Just a thought. Z might not even been duped, it depends on what the outcome was supposed to be. That would make 1000 Kg/h, not 100. But you knew that perhaps. Good point. Despite being over the equator there is no reason to assume that the coverage is symmetrical relative to North and South of the equator. In fact, there is good reason to assume it is not. The average age of airline pilots is 50. This means a great number of redeye flights are being flown by pilots aged 50-55. I don’t think alternates was a case of pilot preference any more than the pilot decides which airport he would like as a destination. The pilot was told to fly a route with a given destination and alternates. Regarding fuel, the pilot would calculate it on the basis of the route he is given. It was only when the FI was published that alternative alternates were mentioned. I am sure that, if you could ask Z about it, he would be astonished that Jinan and Hangzhou were said to be the alternates and would confirm that he knew nothing about it. The flight plan he worked to said Tianjin and Shijiazhuang. Is it just me or has it gone quiet on the debris front? After a flurry of finds there seems to have been a lull again? @Johan – I meant to write 100kg/min not 100kg/hr. It’s easy for me mess up the units when I’m still using a slide rule. That (after the fact) more likely that real time. In fact, Victor’s writeup on BFO spoofing using an AES parameter change shows that BFO would not be hard to spoof at all after the fact. Just some simple arithmetic to reverse North and South. Now you have gone and done it! of debris on this block. On cue some will turn up!! Can someone tell me what happened to the theory of MH370 ‘loiter’ near the Andaman Islands? Has it been convincingly disproved? What were the main problems with it? @Crobbie: Chance of finding meaningful debris should be in steep decay. Most floating debris has had a chance of making landfall.. I think it’s not very likely that there are any more recognizable-as-airplane-parts chunks like the flap and flaperon to be found. But just perhaps there are a few 1-2m chunks that were carried off and incorporated in someone’s house. Smaller chunks like most of B.Gibson’s finds have mostly been sitting on a sand beach for weeks or months when discovered. Many more must have come ashore, then been buried or wash off again. Sooner or later the entire population of floaters will breach and lose flotation, get buried, or come onto a rocky shore and get pulverized by surf. Missed chance of course,would have been to aggressively patrol shores as soon as the Reunion flaperon was found. Not just honeycomb skin, but personal effects. But that’s lost now. Ever sit and watch the surface of a very calm pond. When a fish swims underwater close to the surface you can see the wake disturbance on the surface even though the fish never broke the surface. Add waves and the wake is still there, but humans just don’t have the processing power to extract it. Computers can do the pattern matching to enhance the signal to noise ratio. The waves are the noise in this context. I never heard of submarine detection using IR, but that certainly does not mean it is not happening. @SteveB – re your post on 9/28, even the bulk of the 9/11 hijackers are believed by many not to have known the true plans for the day. Hijack yes…but attack, no. It’s possible that ten or fewer people knew the full plan. @PaulC – The only time you have too much fuel on a plane is when you are on fire. If a diversion is needed early in a flight, the incremental time for a larger dump wouldn’t be material. I should have been twice as observant. I thought you had messed up the kilos. I see what you are getting at now. MAS asks Z to fly a plane with a fishy cargo that demands extra fuel. Sounds like there would be other ways. Please stop with the suspicious fuel load already. There was nothing remotely unusual about the fuel loaded onto MH370. There was no alternate required on that flight because Beijing was VFR on the morning of 08 Mar 2014. Two alternates were listed on the flight plan but given the forecast at Beijing 1 hour before and after the arrival time, neither was legally necessary. You’re allowed for the purposes of this rule to calculate your reserves at the end of the flight (where a pair of Trent 892 are burning roughly 13,000lb/hr) as opposed to the beginning of cruise (when they’re burning 15,000b/hr) and, looking at the LRC tables (which I know almost by heart at this point), MH370 (with a ZFW of 384,000 lbs) would have burned almost exactly 26,000lbs in its final two hours. So, you start with Taxi fuel of 109,570lbs. Subtract 13,010 lbs for everything up to the 17:07 ACARS report (taxi, takeoff, climb, etc) which showed 96,560lbs available for the remaining 5 hours and 8 minutes to Beijing. Subtract 26,000 lbs (reserves) from 96,560 to get 70,560 (trip fuel after 17:07Z). That matches the tables perfectly for a flight of that weight / duration at M0.84. If you look in the factual info, the “planned reserves” on landing in Beijing were 26,235. They even break it down, noting 16,975 of diversion fuel. However they’re doing it is fine. In fact, there’s not one suspicious thing in there as far as the fuel load is concerned, unless you’re a non-pilot making his first foray into long range fuel planning for turbine aircraft. @MattM, Thank you for posting that! Very clear.I also read somewhere that delays at Beijing can be notoriously long due to congestion and that aircraft take on fuel in case they have to divert to alternate airports further out. Is this true? A sub will spend some time at the surface, esp. diesel-electric driven, which cannot run on batteries for more than a couple of hundred n-miles. These, in contrast to atomic subs, will alternately spend some time directly beneath the surface, at snorkle or periscope deapth, recharging batteries. Perhaps that would give them away to a satellite, at least if you know where to look for them. Exhaust smoke from the engines and the water movements around the sub or the snorkle can perhaps be detected in favorable conditions. It is probably also about how much data you can process. A submerged sub will only be seen from a satellite in shallow waters (where they don’t like to be) with clear water and the sun in a favorable angle. Heat signatures for a submerged sub are probably a no from satellite height. Another problem is that we have very little actual data from the plane and have to supplement that with estimates from the report – not a satisfactory situation! I have numerous questions on the basis of what you said but I will just ask a couple to see if you can help. Firstly, we have actual data for 5 mins of the cruise. At 17:01UTC, MH370 was at 34,998 feet, at Mach 0.819 and remaining fuel of 44,500kg. At 17:06, MH370 was at 35,004 feet, at Mach 0.821 with remaining fuel of 43,800kg. Now I realise that the fuel numbers are rounded to 100 so instead of 700kg, lets say it was 600kg, for that 5 min period – that gives us 120kg/m. That actually looks about right because according to one source I read, the consumption of a 777-200ER is 24.8 lb/mi (6,99kg/km) which, at Mach 0.82 and 30,000 feet, converts to 117.1kg/min. The next numbers we have are at IGARI, 16 mins later but the remaining fuel is an estimate, it is not from the plane. Nevertheless, let’s press on! The estimate in the FI was 41,500kg, which gives a burn rate of 143.75kg/min for that 16 min period. I am not happy with that, it looks far too high! The only other information we have is also an estimate in the FI. It states (page 30) that the trip fuel was 37,200kg and flight time was 5:34. Now the report said IGARI was 7,600kg and 41 mins so, from IGARI to Beijing, we have 29,600kg and 4:53 remaining. That works out at 101kg/m. That does not look right! If I take your number of “70,560 (trip fuel after 17:07Z)” – after a bit of converting (!) I get 32,005kg and 4:53 which equates to 109.2kg/m. That looks better! The difference is that you say 70,560lb and the report says 65,257lb. So when you say “That matches the tables perfectly”, I do not doubt your numbers at all – it is the numbers in the report I don’t understand. Sorry, there was one more thing! If we use the total remaining fuel weight at 17:06UTC (from the plane) at page 46 of the report we have 43,800kg (let’s ignore the fact that the same table shows 49,200 instead of 49,100 as total at the start, I am sure that is just roundings). If I use your number of 109.2kg/min (OK that’s my number but it is converted from your trip fuel number) you get endurance after 17:06 of 401 minutes. Add on 25 mins and you get total endurance of 426 mins or 7hrs 06mins. Now that is really close to the 07:10 of the DETRESFA message but is nowhere near long enough for the last ping…. Using the FI estimate at IGARI and the 109.2kg/m makes things much worse than the above so I won’t even bother putting it here. I have found one mistake in my calculation of the 109.2kg/min! I said 32,005kg and 4:53 (i.e. from IGARI) when I should have said: 32,005 and 5:08 – giving a revised 103.9kg/min. Similarly, the 65,257lb is the FI estimate from IGARI not 17:07, so the correct comparison would be (37,200-5,400 = 31,800kg =) 70,107lbs which is close to your 70,560lbs. My error also effects endurance: the revised calc is 421mins plus 25mins which is 7hrs 26mins. Using the report’s estimate of 41,500 at IGARI and the 103.9kg/min, endurance from IGARI is 399mins plus 41mins, gives total endurance of 440mins (7hrs 20mins) – the difference being accounted for by the high burn rate between 17:07 and IGARI. You are comparing apples and oranges. The IGARI estimate of 41,500 kg is based on the ‘flight plan fuel’ of 49,100 kg that the Captain asked for (F.I. 1.1.1), minus nominal consumption from KLIA to IGARI. The ACARS report states fuel quantities actually on board, as measured by the aircraft fuel quantity indication system, which is slightly more than the Captain asked for. “Total departure fuel after refuelling was 49,700 kg (Left Tank was 24,900 kg and Right Tank was 24,800 kg) as indicated in the flight deck. Also you ignore that fuel consumption in flight varies with weight, altitude, temperature and speed. Endurance is increased by flying at reduced speed. Prior to IGARI the airplane was flying at M.82, which is less than the Long Range Cruise speed of M.84. At holding speeds the endurance would be considerably increased. Regarding Geo SBIRS, one of its instruments is a low-res scanner that provides full-Earth coverage (something like every 10 seconds, but don’t quote me on it.) A rough guess at spatial resolution is one mile. Probably cannot detect a commercial aircraft in normal flight. It is intended to detect missile launches. My conjecture is that it detected the MH17 and Metrojet 9268 incidents. My info is the same as yours relative to frame rate and resolution. Don’t have any feeling about detection thresholds in low density environments with little background noise like the SIO. Maybe? Coverage map linked below for the satellites which had a shot at 9M-MRO. Again I understand “At holding speeds the endurance would be considerably increased” but getting a reasonable estimate of kg/min is problematic – even the number from @Matt Moriaty I calculated of 103.9kg/min is significantly different from the 117.1kg/min from other sources. I think what you are really trying to tell me is that we are ‘in the dark’. The numbers we have are not good enough to make any sort of calculation, not even a reasonableness check. 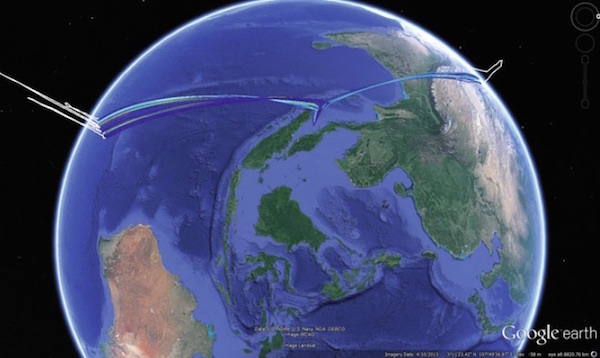 @CliffG, The ‘loiter’ scenario is the only one, as far as I know, that would allow MH370 to fly on autopilot without human intervention and crash close to the 7th arc, as the ATSB believes it must have. The major weakness of this scenario is that it requires the 18:40 BFO value to have accidentally matched that of a plane flying south. It also seems odd that a play would fly hell-for-leather, then stop and linger without communicating with anyone, then continue on a doomed flight to nowhere. People have come up with scenarios that fit this description but they are somewhat unlikely seeming in my estimation. The numbers in F.I. are good enough for the intended purpose. They can stand a reasonable “reasonableness check”. Understood! Can I ask for your help with one other query? There were contemporary rumours that the flight was weight restricted and that 50 seats were blocked. Whether that is true or not we do not know but we do know the flight did leave with 55 empty seats; with 4 no-shows and 4 people ‘replacing’ them from the standby list. There was some initial confusion about these numbers but I believe 4 and 4 is now acknowledged. Why would there have been a standby list if there were empty seats? Back in March 2014, I found an article in an Asian online magazine that said there were another 6 or 7 people on the standby list – but the webpage does not exist anymore. How reliable was that article you ask? Probably not much, I have never seen anything else saying the same… but it was there. It has always struck me as odd that we have heard nothing from the no-shows, saying how lucky they were to miss the flight (that would be a staple of tabloid journalism) and we have heard nothing from anyone else on the standby list (if any), saying similar things (albeit not quite as dramatic). So, if there was anything to the rumours and the flight was weight restricted, what was the limiting factor? The final loadsheet appears at page 45 of the FI. From the loadsheet we learn that MH370 was: 63.4t below its maximum takeoff weight; 22.3t below its maximum landing weight; and, 20.6t below its maximum zero fuel weight. Thus the limiting factor was ZFW – maximum ZFW is given as 195,044kg. My question is this: if we had a flight plan ZBAA0534 ZBTJ ZBSJ and a ZFW of 195,044kg, what is the calculation of just enough ‘Takeoff Fuel’? Can you please help or tell me where I can look. Thanks. If I understand Neil Gordon correctly, then he means MH370 could have been descending for that minute (by c. 2,700 fpm) at 18:40. This makes some sense from the perspective of trying to avoid being detected flying into Indonesian airspace, which Indonesia rules out has happened. I’d also say the ATSB’s first assumption of “initial hook around Sumatra” would generally be consistent with similar avoidance behaviour displayed during the known stages of the flight. Reports on that were very early days and it could simply mean that there were 4 no-shows and 4 admitted to fly, but that doesn’t mean there were more than 4 on standby and they would have been admitted either way. Let me first remind you that MTOW, MLW and MZFW are limits defined by structural considerations. Lower limits may be imposed by performance requirements in consideration of takeoff and landing altitudes, temperatures, runway lengths, obstacles etc. Then “just enough ‘Takeoff Fuel’” depends not only on the ZFW but also on the total mission to be flown, including reserves, which you are leaving somewhat vague. As a very rough rule-of-thumb I would say that the fuel required for a defined mission is roughly proportional to the average mission weight. If you increase the average weight by 10% you would need to load roughly 10% more fuel. You both except that what the FI tells you is what was the amount of fuel on that plane. Maybe there is no serious reason to doubt this information but what was actualy refueled by the ground-crew those figures are not available. From memory the plane landed from the flight before with ~13.000 pounds of fuel left. Every serious investigation wants to know exactly what the ground-crew pumped in the plane. Nowhere are those figures shown as far as I know. If you have numbers please show them. Serious accidents happened before with the plane/pilots thinking there was an amount of fuel there was not. The Gimly-glider ofcourse but also the Tunis-flight that crashed in the Mediterinain sea. To be completely sure about the amount of fuel when MH370 departed KLIA those ground-crew figures should be known IMO. Why don’t you read the official report on the Gimly incident. Also the ACARS reports the fuel quantities independent of human inputs. It also shows he gross weight (GWT in lbs) based on the measured fuel quantity and the ZFW input by the crew at pre-flight rounded to 20 lbs. That is more precise than the TOTFW rounded to 100 kgs. The ACARS fuel consumption of 581 +/-10 kg between 17:01:43 and 17:06:43 is consistent with the FCOM LRC data of 6744 kg/hr at 220t/FL350/ISA. Major errors in the actual fuel quantities or ZFW can be ruled out. Closing comments here now. Please add your thoughts to the most recent post. Thank you!